Great photo and that jewellery is amazing. Mark, I agree that her jewelry is amazing! I’d be curious to learn the symbolism behind each piece she’s wearing. For example, were some wedding pieces, were others given to her when she had children? So many questions! There’s a lifetime written in that woman’s face. Lovely shot. Thank you, Suzanne. In addition to being curious about her life stories, I’m always fascinated to see the ladies of India wearing what I would perceive as formal jewelry while performing even the most laborious tasks (carrying firewood and buckets of soil on their heads, picking tea leaves, etc.) It’s such unique practices that make travel such a joy and a learning experience! Many thanks, Virginia. Hope your weekend has been wonderful! Hannah, well said! A characteristic I appreciate about many eastern cultures is such a reverence for wiser (and older) relatives. So, I see that you’ll also soon be embarking on a ’round the world trip? How exciting! What’s the first country you two will be going to? I think that’s often the best way! (We did the same during our 5-month Asian get-away – beyond Indonesia, we didn’t know where we were headed.) And six months in India should be fantastic – we were there one month, and only were able to explore a handful of spots in southern India. When do you leave? Quite an untold story. It looks like the other lady was camera shy. I agree, Victor – how observant you are. During our travels through Asia, I remember hearing that several of the cultures were superstitious about their photograph being taken. Perhaps that was the case with this woman’s neighbor. Cracking shots. So much colour! Wonderful photos, such vibrant colour. Hi Karen & thank you! I do remember the lighting as being magical the day of my visit. It illuminated the whitewashed buildings, which had colorful accents, perfectly! 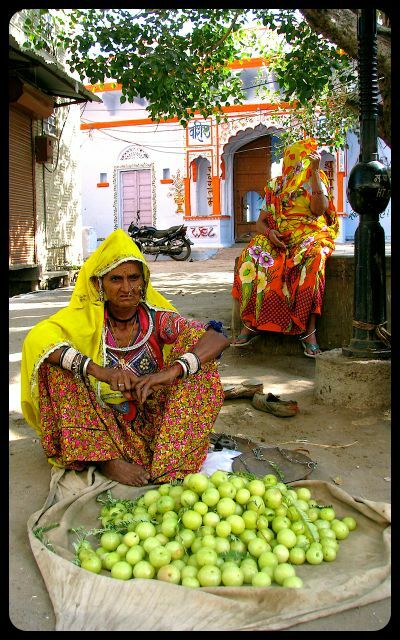 I have been dreaming about going to Pushkar since years! But not yet go the chance! Thanks for sharing these wonderful photos! Sonali, thank you so much! I went there during my 2008 trip to India – the lighting was magical! In which state do you live? Ahmedabad,Gujarat. Have you been to Ahmedabad or any other place in Gujarat? Sonali, no we haven’t yet made it to Gujarat, but I remember seeing promotions while in India. The architecture looks fantastic! Is that the state in which you grew up? Yes. Born in Gujarat. I am a Gujarati. Ahmedabad has now applied for world heritage status. Some amazing monuments with Mughal, British and Hindu influence can be seen in my city. I have captured them. You can see them in my other blog sonalidalal.blogspot.in. Do visit my state whenever you can. Thanks for sharing your other site, Sonali – I’m enjoying seeing more of your work from India! Thanks Tricia :)! I hope to see you sometime in Ahmedabad! Great shots. 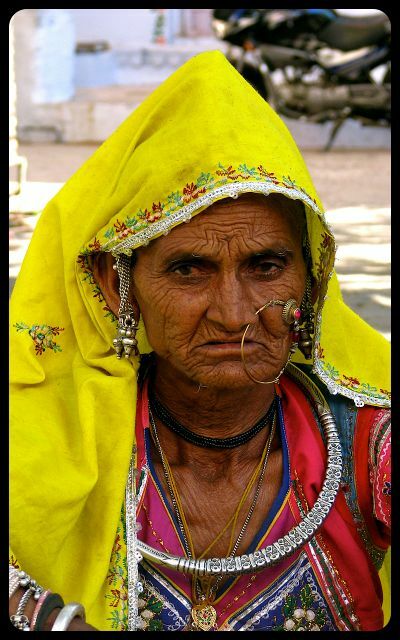 Love the vibrant colours of the merchant’s headpiece, and the look of knowing in her eyes. Anita, thank you & well said! The everyday dress is quite something, isn’t it? I appreciate that each item probably has some important symbolism in the Rajasthani culture. Stunning! She is a gypsy woman. The lady at the back with her face covered is a local. Madhu, thanks so much for providing cultural insight! Do you know if any of her jewelry has special significance?